"Funny, I never shopped. Even my jewelry - not a piece of jewelry I bought for me." - explaining that her jewelry were gifts from her husband, children, and "even the dog." Reports have it that during one trip to New York in May 1983, Imelda spent more than $2 million for jewelry, and another $1.3 million for purchases that included $23,000 for books, $43,370 for flatware, $10,000 for antique dessert service, $34,880 for limousines, and $10,340 for bed sheets. A $5 million dollar collection of rare 17th and 18th century English paintings, furniture and pottery from the apartment of philantrophist Leslie R. Samuel was supposed to be auctioned off. The auction was cancelled because Imelda purchased the whole lot. No price tag is just too high for Madame. Another report recounted how Imelda closed Bloomingdale's in New York for a private shopping extravaganza, walking through the store, pointing at items and simply declaring "Mine. Mine. Mine." 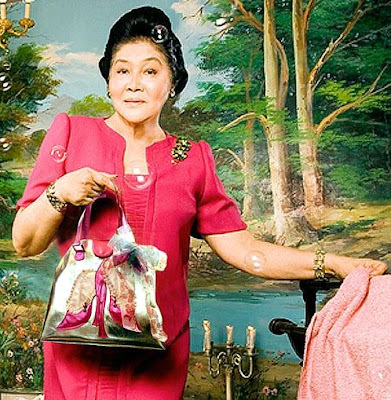 How could Imelda splurge on these shopping sprees while eight out of ten Filipinos lived on less than $2 per day? The answer invariably goes back to Madame's philosophy of Beauty. "Yes, I bought those things [referring to her 21-yr shopping spree] for my country, only the best," she says with a defiant air. "It is shallow people who think beauty is frivolous and excessive. If you are bringing beauty and God, you are enriching the country. Rice feeds the body, books feed the mind, beauty feeds the soul. It is one thing I can really be proud of and stand tall in the world." How can one counter such consistency, such single-minded purpose to uphold beauty. Beauty is the key to everything. Beauty is God made real. "Filipinos want beauty." "People say I'm extravagant because I want to be surrounded by beauty. But tell me, who wants to be surrounded by garbage?" So the next time you find yourself in a shopping mall, think of Madame and see the beauty in each and every merchandise. Then shop till you drop! Shopping. Beauty. God. The Filipino People. It follows, doesn't it.